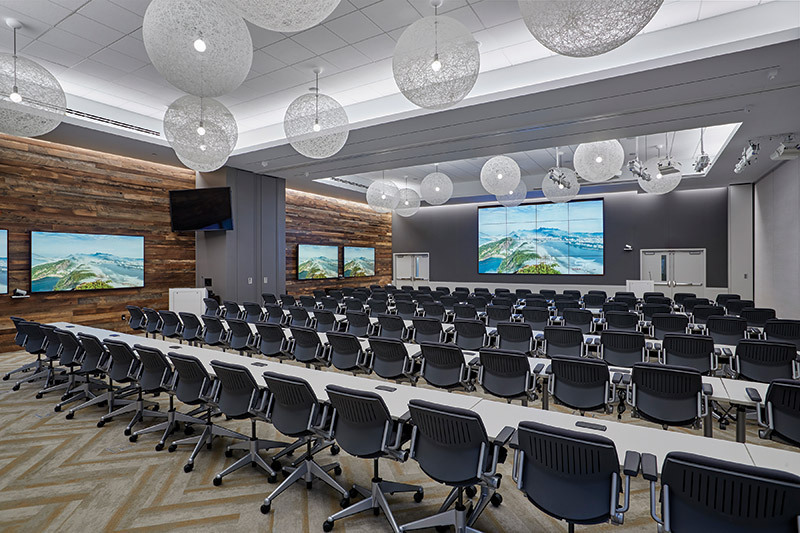 Celgene corporate campus’ modern AV makeover. The quad divisible ballroom in a classroom-setting configuration. 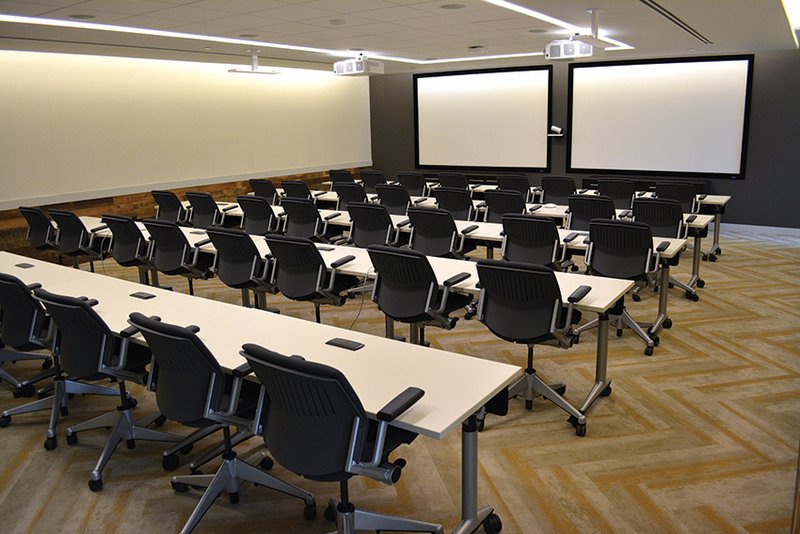 From a 32-person gathering to a 500-person event, every seat is an AV sweet spot for presentations in the newly renovated conference rooms at the main campus of Celgene Corp. The main emphasis for this article will be the quad divisible ballroom on the first floor, because it has an abundance of AV in one area. It’s beyond our scope to detail all the AV in this huge project; however, the equipment list provides a much more expansive picture. The quad divisible ballroom contains two large, 4×4 videowalls that can be split into several separate configurations. The flexible, moveable spaces can function with full audio and videoconferencing capabilities, and they boast a rather extensive selection of microphones. 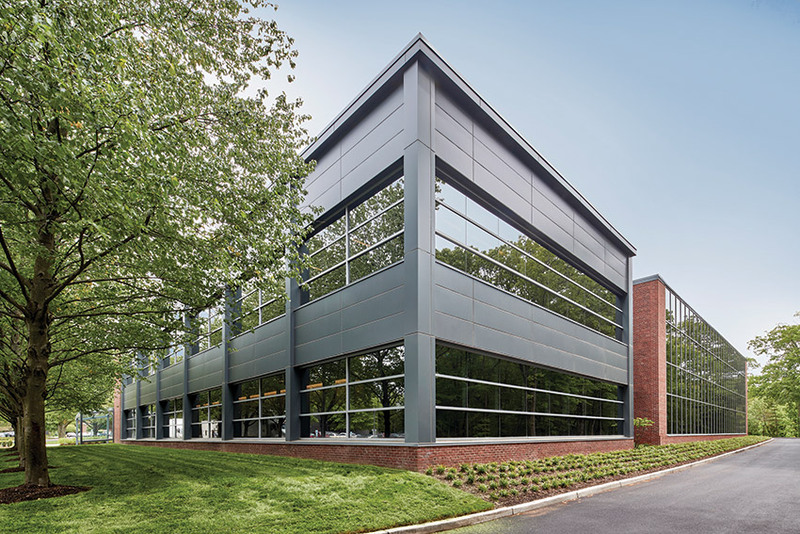 As the company continued to grow in New Jersey, there was an internal need to meet under one roof. 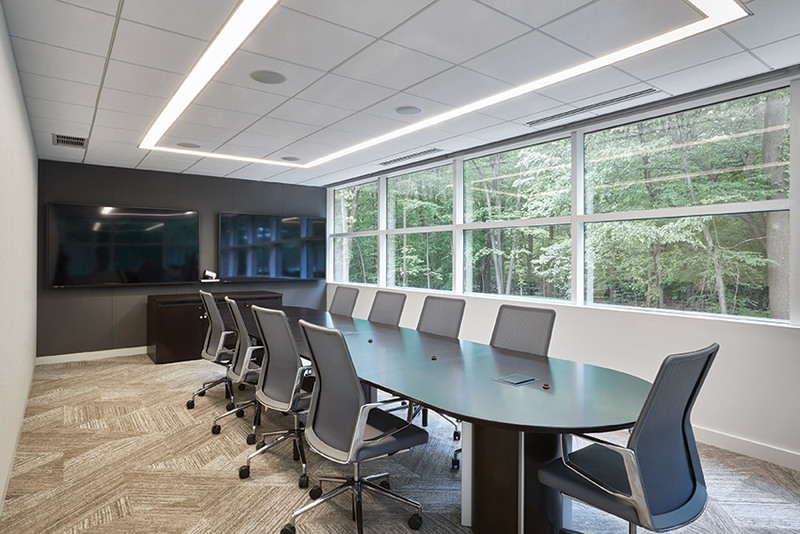 Obviously, bringing meetings to its Summit NJ headquarters was more cost effective than renting a hotel for a variety of departmental gatherings and group presentations. Cascading waterfalls intermingled with digital signage displays create a tranquil setting. 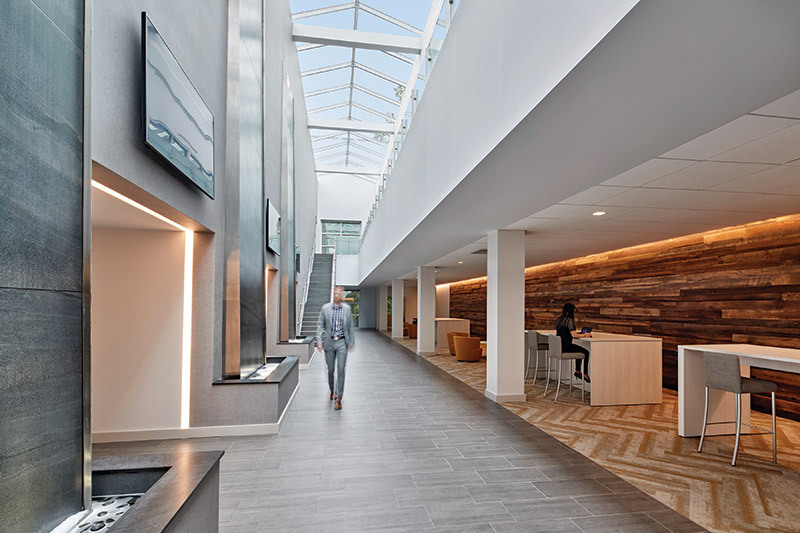 The updated J building, which occupies approximately 140,000 square feet at Celgene’s global headquarters, was designed to accommodate office and conference space, but with a big emphasis on special events. Because of its extensive experience and its focus on corporate AV and construction—from conception to post-install service—Avectus was chosen as integrator for the project. Avectus, based in Lebanon NJ, had a longstanding record of success doing projects for Celgene, as well. Celgene Corp.’s updated J building has a new look both inside and out. The design started in October 2015, Meyer said. “We started AV construction in January 2017, and we had a five-month build and commissioning in 2017,” he stated. Meyer worked closely with architectural firm Highland Associates on the project. Avectus also worked closely with ClearOne’s new CONVERGE Pro 2 audio DSP platform for conferencing and sound reinforcement, field-testing under the guidance of the manufacturer. Those aspects will be discussed later. Turner Construction, a worldwide construction company, was also a project collaborator. There’s seating for 90 in the two-way divisible room. Audio management and camera locations were two major challenges in the quad divisible ballroom. The 16-foot ceilings made it impossible to install ceiling microphones and difficult to manage table and floor microphones. Fortunately, a huge variety of Shure wireless—including 80 boundary mics, along with various handheld, lavalier, ear set and desktop goosenecks—was available. “We had to come up with a solution that allowed audio to be heard clearly throughout the entire space, and every seat and presenter’s location to be picked up to go to the far end,” Meyer explained. He noted that 64 standard JBL Professional 26CT 70V ceiling speakers “certainly did the trick,” accommodating the high ceilings. Speakers are driven by Crown and Extron amplifiers. The 12-person videoconferencing room is infused with AV technology. According to Meyer, audio processing was a major consideration. “We worked very closely with ClearOne’s new CONVERGE Pro 2, so they could develop the firmware as we were [addressing] issues with the size of the room. Three weeks prior to our final turnover commissioning, Shure Microflex released a new firmware that would allow enough frequencies as we’d designated in the place.” He added, “Those were just some of the audio hurdles. Programming of that divisible space was arduous, to say the least!” Equipment is housed in Middle Atlantic racks. On the video side, placement of Cisco ceiling cameras for videoconferencing was another challenge, because they couldn’t be permanently mounted on moving walls. The solution was four Custom Display Solutions custom motorized-lift ceiling camera mounts strategically located to cover the ballroom. More details on audio processing and cameras are to come. Meyer acknowledged that every wall on the site that was used for videoconferencing or audio reproduction had a need for sound paneling. An innovation brought to bear was recycling reclaimed wood from old New Jersey and Pennsylvania barns. “We used that wood surrounding our displays,” he revealed. “Because those wood planks are rough hewn, they worked surprisingly well from an acoustical perspective. The sound paneling system was made by piecing together a custom nylon track system, one-inch batting and fabric wrapping to match the interior décor.” The divisible wall manufacturer is Modernfold. “When the rooms are divided into four spaces, the orientation of the rooms changes 90 degrees,” Meyer pointed out. “In this configuration, we put in twin 98-inch Planar displays with a Cisco videoconferencing camera between them. Each of those rooms can fit 32 people in a conference/boardroom setup for completely independent meetings.” Accordingly, 20 Shure wireless microphones are assigned per quad room: 16 boundaries, two handhelds and two lapels. There are several Crestron wireless touchpanels for each quadrant, as well. The multi-purpose boardroom offers audio- and videoconferencing capabilities. In addition, there are four 80-inch and two 90-inch Sharp LCDs positioned strategically on Chief mounts throughout the space when it’s completely open, allowing people to view the smaller print on the front displays. Taking into consideration the widest view, the ballroom’s 16-foot-high wall can be opened into the atrium seating area. Thus, once the combined atrium and quad divisible ballroom are fully opened, 500 people can sit for large gatherings, such as corporate events. Meyer also noted that Avectus worked with Eric Scott, RA, Architect and Senior Associate at architectural firm Highland Associates, to put together four large, 6’Wx25’H water walls in the front entrance atrium. In between each one is a large, 70-inch digital signage display from Sharp. “It’s a good mix between natural aesthetics and technology,” Meyer affirmed. The main conference center skylight atrium brings natural light deep within the building to provide tranquil areas for collaboration and, for longer functions, food service. Thus, the atrium is a delight of visual and auditory sensation for employees and visitors alike. 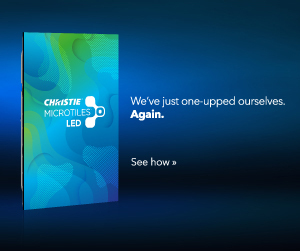 In the atrium and outside the many rooms and hallways, Celgene’s internal digital signage runs multiple screens of content created specifically for the space and its attendees. Information is provided by Omnivex Moxie software that plays on IBASE digital signage players. Avectus has installed IBASE players and Omnivex-run digital signage solutions for Celgene across the globe. Background music throughout the atriums and entranceway is via CATV music station. A wireless AirMedia AM-101 presentation gateway, from Crestron, was provided for meetings and collaboration for each quadrant of the quad divisible ballroom. Crestron access was via TST-902 nine-inch, pop-out wireless touchpanels (one per room) that could be taken anywhere within the room. In addition, a TSW-1060 10-inch touchscreen was built into each lectern. Device access provided full control of the AV systems, including Lutron lighting and camera control for videoconferencing, as well as input source selection and volume control. There are also two Extron DTP CrossPoint 86 4K scaling presentation matrix switchers specifically used for VTC camera switching. Videoconferencing in the quad divisible ballroom is via four Cisco TelePresence SX80 codecs with 10 Precision 60 PTZ cameras. The SX80 delivers high-definition video and, by having four codecs—one per quadrant—it allows each individual, divided room to separately have its own VTC meeting. The aforementioned challenge of no fixed wall to anchor the cameras was solved using four CDS custom motorized ceiling camera mounts. Now, let’s turn to the details of Avectus’ use of the new ClearOne CONVERGE Pro 2, of which a total of 13 products is installed. For the 128TD Telco unit, there’s a Telco system for each of the quadrants of the quad divisible ballroom. And, there are nine more 128Ds for all the individual source inputs from each of the Crestron DM inputs, as well as the 80 wireless microphones in the quad spaces alone. Both the 128TD and 128D models have 12×8 mic mixers with Dante network bridge. There’s also a ClearOne universal control interface and dialer for CONVERGE. Highland Associates, an architecture, engineering and interior design firm, located in New York NY and Clarks Summit PA, was engaged by Celgene Corp. to gut an existing warehouse building that had been renovated in a piecemeal fashion over time, turning it into a state-of-the-art office and conference center. It worked closely with the integrator, Avectus. Both the office and the conference center space have large, linear skylights that bring light deep within the building and provide areas for collaboration. Staff and visitors who enter the main conference center skylight atrium are greeted by digital signage and four huge water walls that provide both a visual and an auditory sensation. Because there was a need to have multi-sized and configurable spaces, large operable partitions were used to subdivide the quad space. When fully opened, the room can accommodate a large ballroom event or a speaker, with a capacity of up to 500 people. With the operable partitions, the rooms could be scaled down to a 32-person conference room or any number in between. Given the high demand for meetings, a prep kitchen was added adjacent to the space so that meals could be warmed and prepared in close proximity, without having to use the main cafeteria that is located in a different building on the campus. In addition to the conference center, the client needed office space similar to designs that Highland had used successfully in its previous projects. Interior offices overlook low workstations set closer to the curtain wall, allowing all employees access to light and outdoor views. Collaboration spaces are situated under skylights and in adjacent zones to allow people to get up from their stations and interact with others. This design/build project, undertaken in coordination with Turner Construction, was designed to LEED-certified criteria, and it used sustainable materials in the design. In 1986, David Stirling, PhD, and Sol Barer, PhD, planted the seed that would become Celgene Corp.—a global, integrated biopharmaceutical company that’s primarily engaged in the discovery, development and commercialization of innovative therapies that treat cancer and immune-mediated inflammatory diseases in patients with limited treatment options. There are hundreds of clinical trials at major medical centers that are dedicated to evaluating compounds from Celgene. Investigational compounds are being studied for patients with incurable hematological and solid-tumor cancers, including multiple myeloma (MM), myelodysplastic syndromes (MDS), chronic lymphocytic leukemia (CLL), non-Hodgkin’s lymphoma (NHL), pancreatic cancer, non-small-cell lung cancer and melanoma. In addition, several compounds are being evaluated as therapies for serious inflammatory diseases, such as psoriasis and psoriatic arthritis.